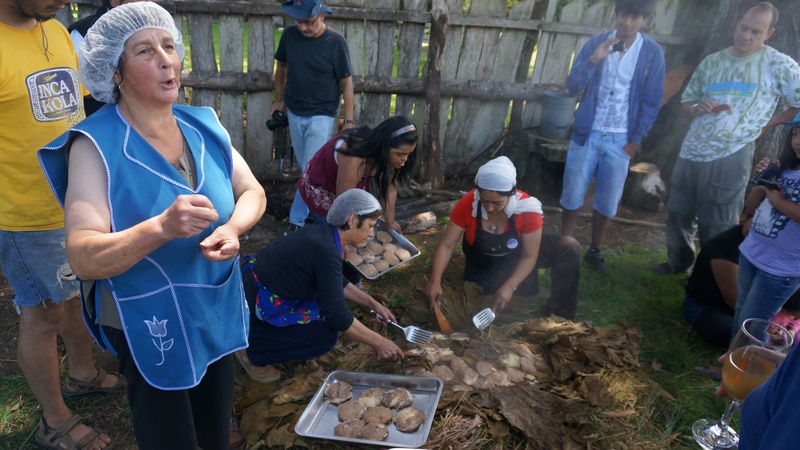 Aside from homemade cheese and jam, a curanto was the most distinctly chilote cuisine we were lucky enough to enjoy, several times. 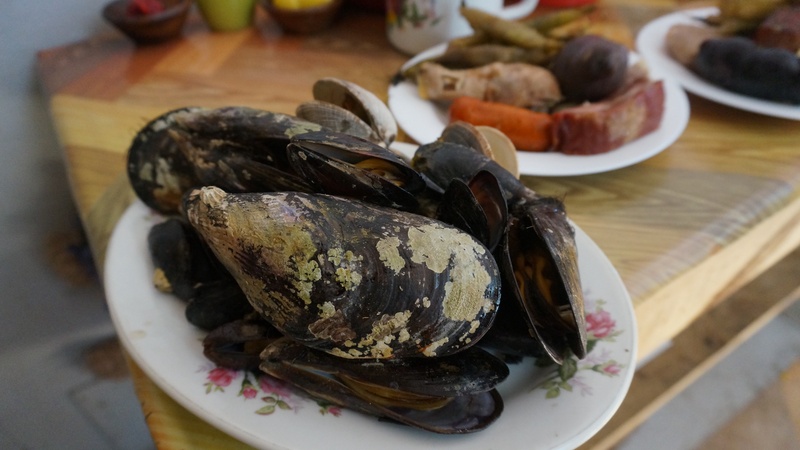 Nowadays, the people of Chiloé can cook a curanto in a large olla, or pot, on the stove. 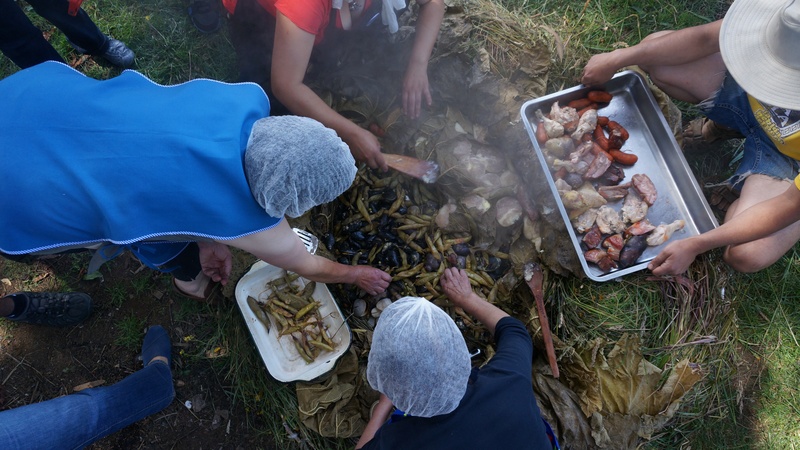 However, traditionally a curanto is cooked and eaten outside. The benefit of cooking a curanto in a pot is that you can save all the broth from the melange of ingredients, which is then ladled out and sipped on as a lovely addition to the meal. Some even say this special liquor is a type of aphrodisiac! 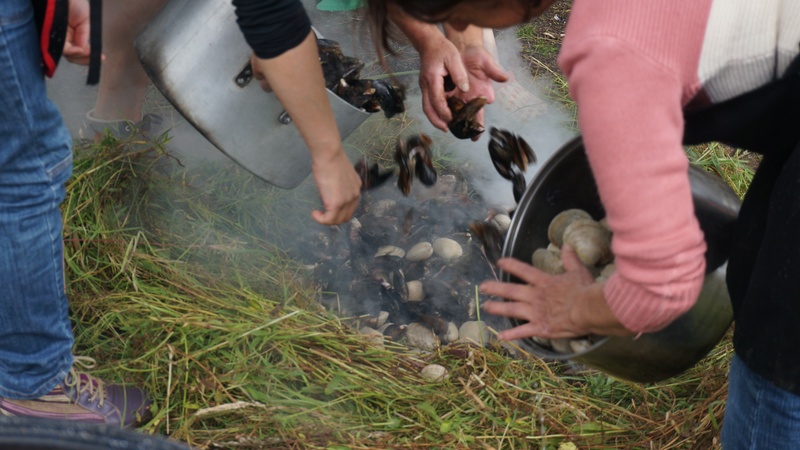 The benefit of the traditional curanto is the rich, smoky flavor imparted by the firepit. 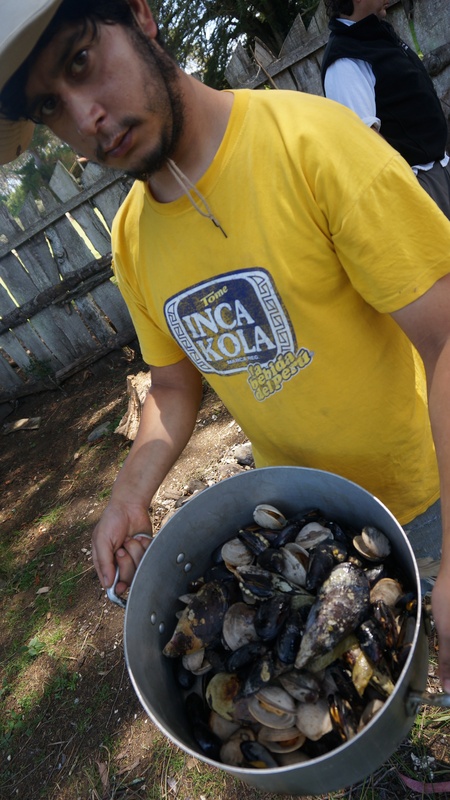 We had the pleasure of learning about curantos from the family farm we wwoofed at, Al Norte Del Sur. Curantos can be an all day affair, requiring much preparation. As you can see from the pictures below, the result is well worth the effort! Stones are heated to blazing levels in the morning over a big fire. 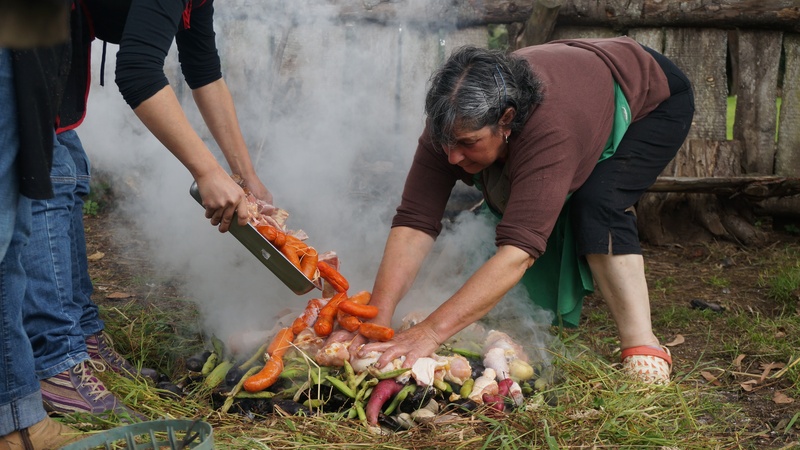 The stones provide the heat to cook the curanto so it is essential that they get very hot. 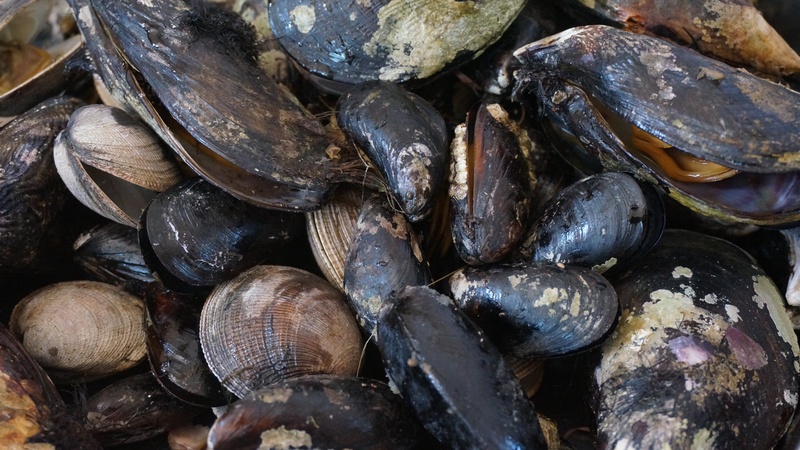 Once the stones were ready, they piled on sacks of gigantic mussels and clams, freshly picked potatoes, fava and pea pods, chicken, pork belly and sausage. 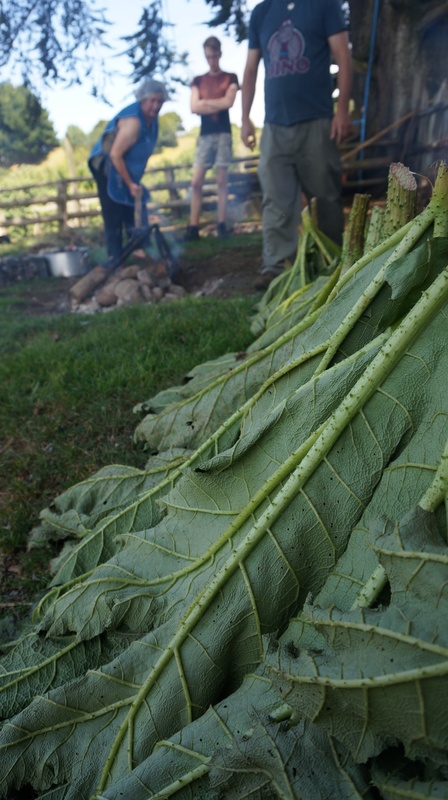 They covered the meat with gigantic leaves that grow all over the island. 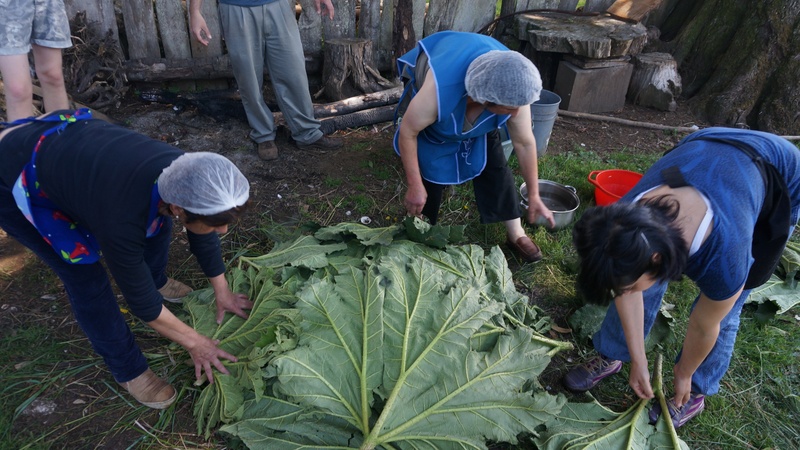 The leaves help to seal in the heat and also provide a platform to cook the final component of a curanto: milcau and pan de papas! Milcaus are like giant potato dumplings, made from flour, the starch extracted from shredded raw potatoes, and pork fat. Pan de papas consist of flour and freshly mashed potatoes, formed into a disk and stuffed with cheese. 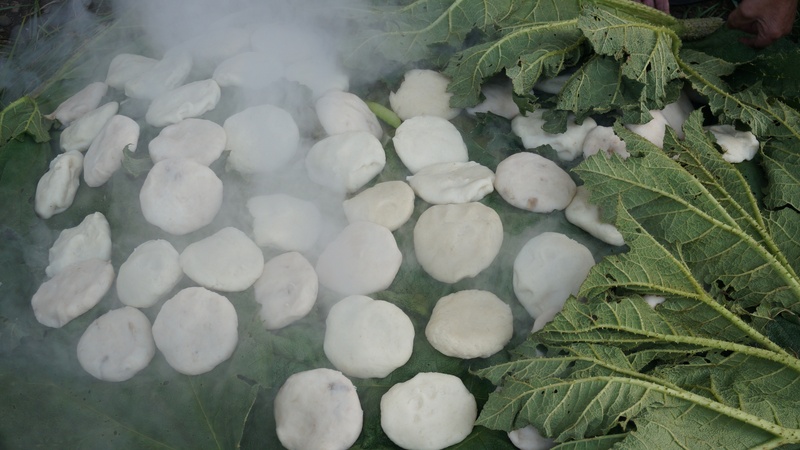 These delicious dumplings get spread over the steaming heap of food and covered with more leaves. 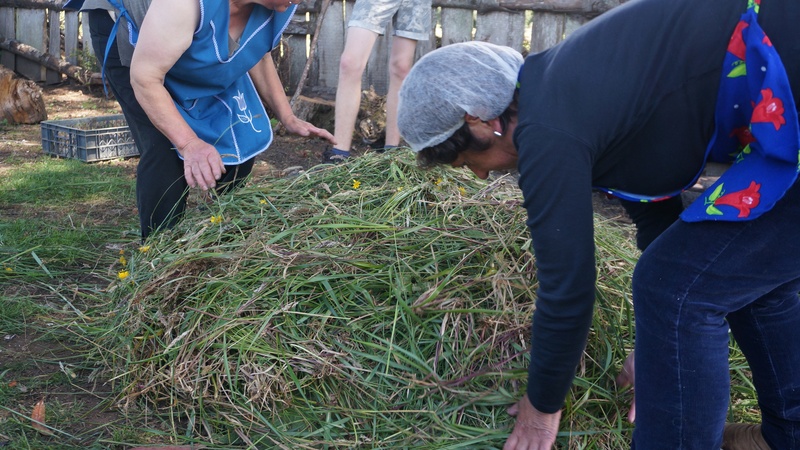 The entire thing is then covered with a mountain of tall dried weeds and grasses to help seal in all the steam and heat. 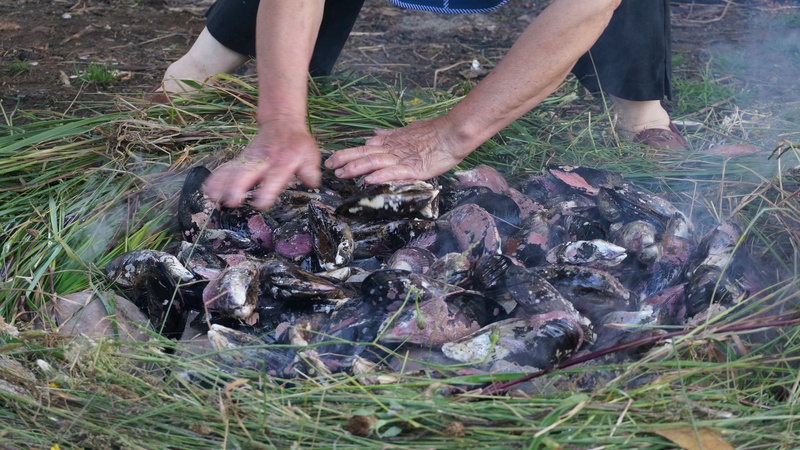 After about an hour, we would gather around the fire pit and, like kids on Christmas morning, watch wide-eyed as the family matriarch peeled away the grass and leaves revealing the feast beneath. 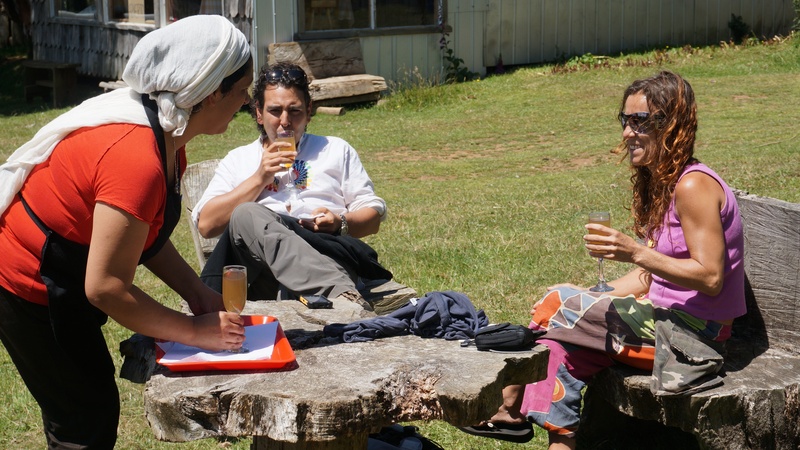 Traditionally, people gathered around the curanto to eat directly from the fire pit, but we filled our plates and ate the feast on the grass in the sun. 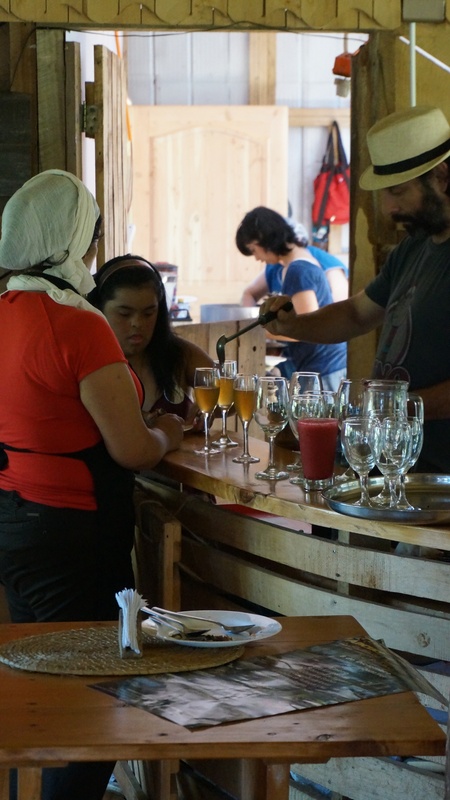 Additionally, Al Norte spiced up the affair a bit more, serving up glasses of freshly harvested strawberry smoothies and a cocktail of homemade fermented apple cider called chicha, warmed and mixed with honey. 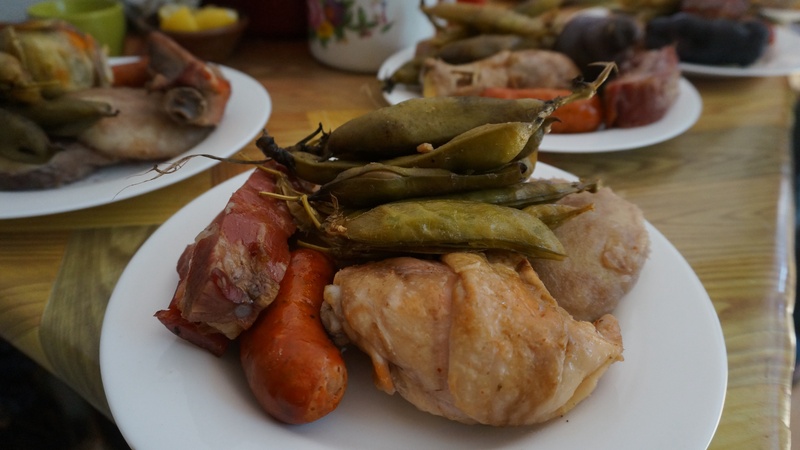 We loved the taste of the chicha, a much more rustic flavor than the sweet Terremottos of Santiago! Since the family has a restaurant at the farm we were lucky to taste these curantos and cocktails several times during our month long stay. The restaurant patrons always left the feast happy, and so did we!